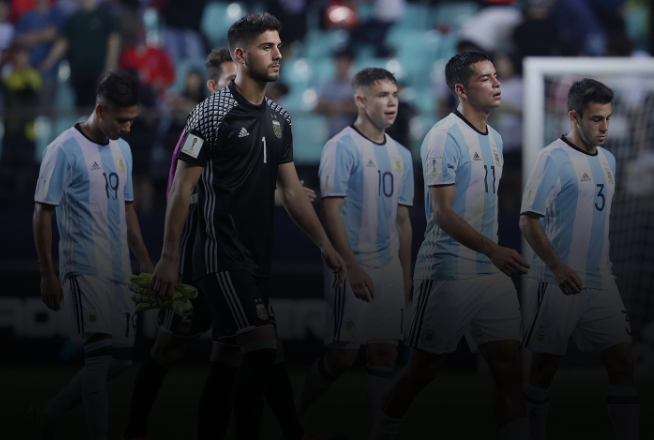 A place in the final was up for grabs as the favourites, Argentina were up against Paraguay, who against all odds overcame what was a mediocre Brazil side in the quarter finals. The two sides had met previously in the competition with Argentina squandering a two goal lead in the second half. That, along with Albiceleste manager, Gerardo Martino’s history as coach of the Paraguayan national team made for an intriguing clash and one that some thought may go down to the wire. However, those expecting a close game saw the complete opposite as Argentina ruthlessly swept Paraguay aside by 6 goals to 1 with Lionel Messi once again at his brilliant best, laying on the assists for 3 of his team’s 6 goals. The ridiculous amount of space between the lines and Argentina’s exploitation of the right-hand side proved Paraguay’s undoing. No mercy was shown to the Paraguayans with Martino’s men looking to cement their place in the final; they showed no signs of letting their 2 goal lead slip this time around despite Lucas Barrios halving the deficit on the stroke of half-time. With Messi situated on the right it seemed inevitable that Argentina would predominantly look to capitalise in that area and they did exactly that for a large portion of the game. 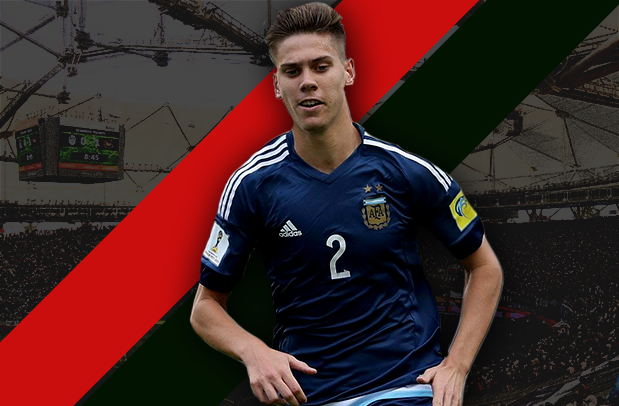 Observing the weakness of Ivan Piris, Paraguay’s left back who is actually a natural right-back, Argentina often looked to overload the zone which he was occupying. They often looked to Biglia, Messi and Zabaleta to combine and alternate positions on the right, causing serious disruption to the strict man-oriented zonal marking system employed by Paraguay and the insistence of their individual players on pressing the ball when it reached a particular zone. Space was regularly created in the centre for Javier Pastore who ended the game with a goal after Messi’s activity on the right hand side created room for him in the no.10 space to finish past Paraguay goalkeeper Justo Villar. They encountered similar problems to Colombia in their fixture against Argentina, Messi roaming and swapping positions with teammates when being tracked by an inverted full-back lead to confusion as to whether he should be followed all the way or tagged onto another player. This ultimately disrupted the organisation of the Paraguayan defensive block. The diagram below is a perfect example of Argentina’s exploitation of the right flank. In this image, Argentina combine down the right and Pastore eventually scores. Messi and Biglia switch positions while Zabaleta makes a run down the right touchline. This in turn creates room for Messi in the half-space who runs towards goal, attracting the Paraguay defensive midfielder to him. He then plays in Javier Pastore who doubles Argentina’s lead. Paraguay’s peculiar hybrid shape was partially responsible for their inability to cope with Argentina in that zone. They set up in a very narrow 4-4-2 shape with wingers who situated themselves in the half-spaces in defensive phases so as to have access to the Argentina wide players while still retaining a compact shape. This could have possibly proved problematic however as it would have meant that Argentina’s full backs would have space and time to receive the ball. There seemed to be a logical solution to this problem, push Piris into the midfield and set up in a hybrid 4-4-2/3-5-2 shape. This allowed Paraguay to maintain compactness in midfield but at the same time not concede too much space in the wide areas. As well as this, it allowed Piris to apply pressure on Zabaleta at right-back or Messi when he occasionally dropped deep in his wide right position. Right back Bruno Valdez would also come narrow, forming a back three with the 2 centre backs, they constantly had a defensive overload as Argentina usually only had Aguero on the shoulder of the last defender providing depth to the attack while Messi and Pastore roamed and swapped positions and Di Maria stayed wide or at times looked for space between the lines. 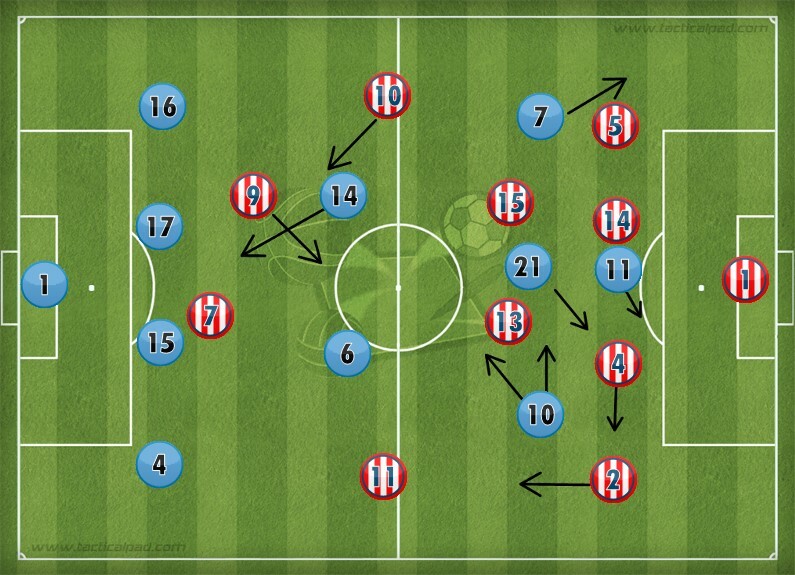 In this image we see Paraguay’s alternate shape, which they shifted into on occasion during the game but primarily in the first half. Piris pushes up into the midfield 4, creating a five-man midfield, there is now a severe reduction in the space that Argentina would have out wide had Piris remained in the back 4. He also now has access to Zabaleta and is able to press should he receive the ball. In the circle, we can also see that they have an overload as there are 3 defenders to one Argentine attacker. However, one must consider the space vacated and made available in the left channel. Aguero regularly moved into said space whenever Piris pushed up, creating space for his teammates and looking to receive the ball in dangerous areas. Paraguay soon picked up on the danger that constantly arose from Argentina’s right so to counter this, they attempted to overload the right, congesting the space and allowing little room to manoeuvre for Messi, Biglia and Zabaleta. Argentina had little choice but to play down the other flank, meaning that they were seemingly unable to play through Messi. This did nothing to stop Messi, however as he constantly roamed about the pitch and between the lines, making him almost impossible to be contained by the Paraguayans. In addition to this, the Argentinians are one of the most multi-dimensional attacking sides in world football. Their array of attacking talent allowed them to vary the way in which they penetrated the opposition back line. From dominating possession and clever player rotation, to soaking up pressure and exploiting the spaces in attacking transitions; adding Angel Di Maria into the equation, who is in my mind the best out-and-out winger in the world also allowed them to stretch the Paraguayan defence, creating space for Pastore in the channels. At times, he functioned as what may be called a ‘central winger’, a no.10 who moves laterally across the final third in order to move into the channels to link play or create space for his teammates. In this image, Di Maria is in possession in the wide area and has drawn two players towards him with the 3rd Paraguayan player also keeping an eye on him and not Pastore making a run into the channel. Argentina’s qualitative superiority means that he cannot be left 1v1 with the Paraguay full back Bruno Valdez; he must be doubled up on. Pastore makes a run into the channel, and if not followed, has time and space to pick out Aguero in the box or run at the centre-backs. If the near side centre-back tracks him then he leaves his partner 1v1 with Sergio Aguero, another world-class attacking player who one cannot afford to leave 1v1 with a defender. It is always assumed that when a team playing 4-4-2 is up against a team with a spare man in midfield they are always likely to come unstuck. 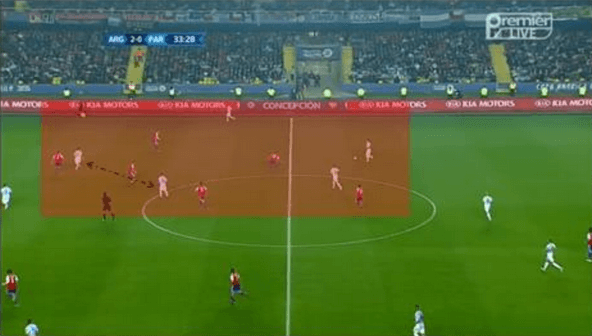 Although when the 4-4-2 is deployed correctly and the team is well drilled and compact, you witness the rare exceptions, for example Atlético Madrid. Paraguay’s, however, was not a rare exception. They constantly conceded space between the lines and were always overloaded in midfield; most teams tend to stagger their midfield when faced with a numerical inferiority whereas Paraguay did not. Time and time again Argentina found space in abundance and often had 2-3 players between the lines. This, accompanied with poor pressing and reluctance from the Paraguayan players to press as an entire unit and cover the space their teammates left behind when attempting to win the ball led to Argentina seemingly having the entire pitch to themselves at times. Despite being in a fairly organised shape in the image above, finding space between the lines is still fairly straightforward for the Argentina midfielders as result of the 4-4-2 shape and the lack of vertical compactness in their block. These above two images show how their pressing led to chance after chance for the Argentinians. In both images, the Paraguayan players press too eagerly which seems rather foolish considering Argentina are a far superior side in keeping possession and are adept at circulating the ball under pressure. This, added to the fact that they have an overload when in possession makes their attempts to apply pressure futile. In the first image when Mascherano has possession, both strikers attempt to press almost unaware that it is 3v2 in favour of Argentina. 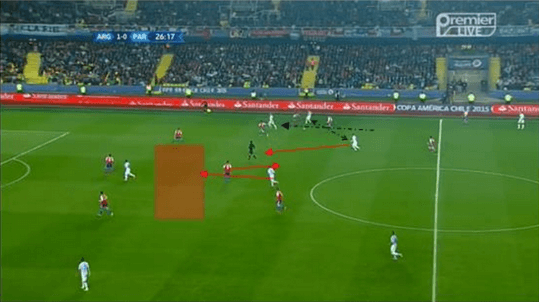 Instead of dropping off and forming a compact shape to stop Argentina progressing into midfield, they pressed the ball and allowed 3 players to find space behind their wave of pressure. This may have been acceptable had the supporting players supported the press or covered the space left behind; however they did neither and Argentina ran riot. Every intelligent coach knows that for pressing to be effective, it requires the entire team to participate by either applying pressure to the ball, covering the space in behind, blocking passing lanes or making sure the team retains a compact shape. Aguero’s positioning was partially why the Paraguayan defenders refused to push the defensive line forward and squeeze the space. Aguero often stayed on the shoulder of the defender, providing depth to the attack; it forced the Paraguay defensive line back, creating even more space for the attacking midfield three. As expected, Argentina have booked their place in the final in Santiago with an absolute decimation of the team they drew with earlier in the group stage. 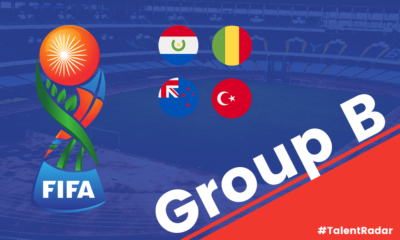 They come up against a Chile side who will be buoyed by the home support and have become one of international football’s most precocious sides. 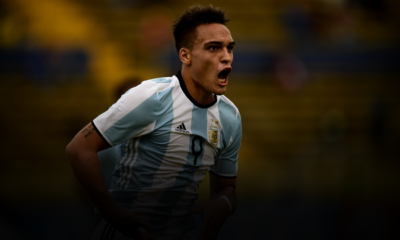 Argentina will know all too well the threat that Chile’s high pressing approach can pose. Despite the home support in favour of Chile, the Albiceleste will still be confident of getting their hands on the Copa America trophy and partially erasing the heartbreak of last year’s World Cup defeat to Germany.